Ever since opened its doors in 1981, we have always focused on exciting and delighting our cusomer with our premium range of quality food ingredient and bakewares. We continuously seek excellence in forming strategic partnership with reputable and World Class food companies to bring the best to cater to the needs of our esteem in an ever changing world and lifestyle. After 28 years of excellence, have expanded to 2 acre plant in Desa Cemerlang for better facilities and convenience. We have increased our capacity to meet the growing expectation of our customer, yet never compromising on quality and freshness. The new plant enable us to provide Test Kitchen facilities that caters for in-house training, product demonstration and application for customers. A local showroom for San Neng Bakeware is also possible. 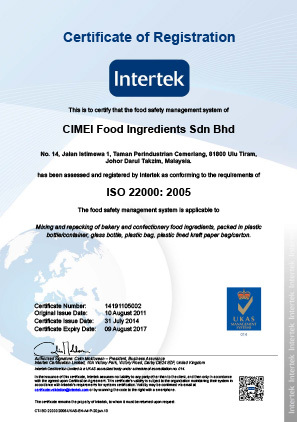 We are adopting international quality standards in our operations and we are in the process of acquiring the renowned ISO22000 certification together with HACCP and Halal Certification, Which is yet another milestone to our vision of becoming a leader in the industry. with our insight that taste, quality and freshness makes the small yet critical difference within the food and baking industry, we understand how importance it is to provide quality of the highest order to our customer. Therefore, we are totally committed to providing only the best product, backed by excellent reliable service. Customer satisfaction is our foremost goal and our strategic commitment is to be the best in the food industry. According to our philosophy, our principle and customer are our partner. In order to meet the continuously increasing and challenging demands of our partner, we shall focus efforts on upgrading our product, service and facilities in order to provide them the platform to enjoy the latest and the best. The staff are our most important capital resource and at we are like a big family, harmoniously, working towards a common goal of excellence. Anyone who works together with us will quickly realize it. Our staff are contented because their great personal commitments are adequately appreciated.
" WE ARE GROWING TO SERVE YOU BETTER "